city is an inevitable stop for a tour in the north of the island and in the Gallura, as well as a perfect starting point for active tourists who want to visit the area by car. Bajaloglia Resort is located on a hillside just a few minutes from the picturesque town of Castelsardo. The Hotel and some private villas overlook the medieval town, offering a splendid view over it and the sea. Castelsardo is only 400 m from Lu Bagnu, about 70 km from Alghero airport and only 30 km from the port of Porto Torres. From Castelsardo is easy to reach Santa Teresa di Gallura in about an hour, touristic town in the far north of Sardinia, from where ferries depart daily for the nearby Corsica. Set among myrtle trees, mastic and characteristic prickly pears, the Bajaloglia Resort, the only 4-star Superior Hotel in Castelsardo, is placed in a fascinating panoramic and peaceful location. The many terraces offer sea view and invite you to fully enjoy the contact with nature, breathing in deeply the fresh salty air. Modern and elegant design, the Bajaloglia Resort is ideal for a relaxing holiday. 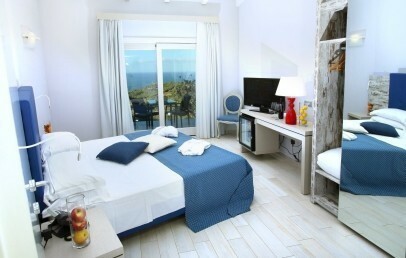 The 12 rooms of Bajaloglia Resort are decorated with warm colors and have a modern style. From all rooms you can access through a glass door to the private terrace with chairs and table, which offers a spectacular sea view. 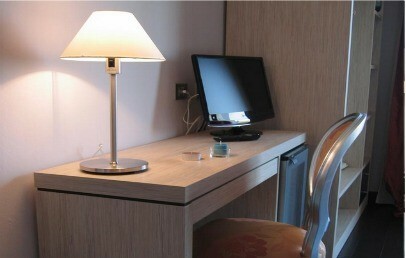 Wi-Fi connection is complimentary and available throughout the entire hotel. The Classic double rooms have a sea view and a bathroom with shower. 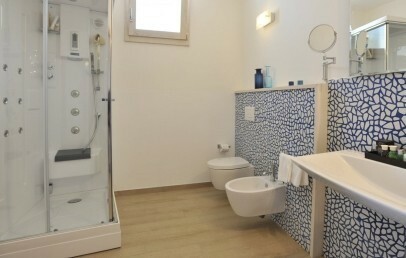 The Superior double rooms have view over the sea and the town of Castelsardo. Beach towels, bathrobes and free Internet access are provided to the guests. Possibility of thrid bed. 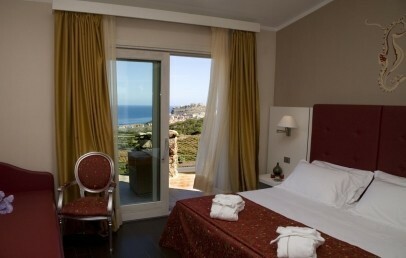 The Junior Suites have view over the sea and the town of Castelsardo. Beach towels, bathrobes and free internet access are provided to the guests. The bathroom has a tub or a shower (some with massage jets). The Junior Suites Deluxe are bigger with approx. 50 sq.m. and can accommodate up to 4 people (3rd and 4th bed is a bunk bed or one sofa bed). The bathroom has a shower with massage jets and same amenities as the Junior Suite. The Junior Suites Prime is spacious and bright with approx. 36 sq.m. with terrace. The bathroom has a shower with massage jets and same amenities as the Junior Suite. The hotel offers on request a free shuttle service with scheduled times for the beaches Ampurias or Sa Ferula. Beach service is available at the Ampurias beach at a charge. The Restaurant L’Incantu is a joy for the eye as well as for the palate. The large, bright windows and outdoor terraces offer a view of the village of Castelsardo, the surrounding hills and the sea, creating a romantic and intimate atmosphere. The kitchen follows a philosophy seeking to promote regional food and ensure the authenticity of the products used. It's a philosophy that, as in ancient times, follows the rhythm of the seasons and offers specialties based on the availability and the freshness of raw materials. The culinary delights prepared at L’Incantu Restaurant are always accompanied by the best wines from the cellar, carefully selected among the best regional and national wines. There are several possibilities that Bajaloglia Resort offers its guests to relax and find some moments of privacy during the day. In the shadow of white drapes and lying comfortably on the soft pillows, the Oasis of Relax immersed in the vegetation provide intimate moments to spent reading a good book or just to feel at peace with themselves. City tax is € 2,00 per person/overnight, for a maximum of 7 consecutive overnights. Children/youth under 14 years are exempted and the tax has to be paid on spot. Double room spacious and well-lighted, on request an additional 3rd bed. 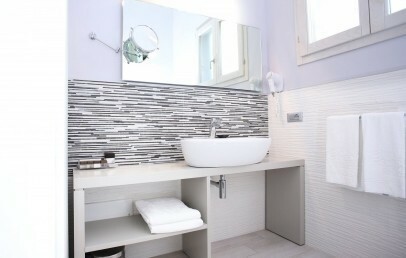 Decorated with warm colours and characterized by a modern style and by the care of details in it’s essentials. The bathrooms have a column shower, an hairdryer and a vanity mirror. Through a glass door you may enjoy a private terrace with chairs and table, which offers a spectacular sea view. Double room spacious and well-lighed, on request an additional 3rd bed. Decorated with warm colours and characterized by a modern style and by the care of details in it’s essentials. For the guests of Superior rooms beach towels and free Internet provided. The bathrooms have a column shower, an hairdryer and a vanity mirror. Through a glass door you may enjoy a private terrace with coaches and table, which offers a spectacular sea view. Double room spacious and well-lighed, on request an additional 3rd bed. Decorated with warm colours and characterized by a modern style and by the care of details in it’s essentials. For the guests of Junior Suite beach towels and free internet provided. The bathrooms have a shower or tub (some with hydromassage function), complimentary toiletries, hairdryer and a vanity mirror. Through a glass door you may enjoy a private terrace with couches and table, which offers a spectacular sea view. A well-lighted and spacious Junior Suite Deluxe decorated with warm colours and characterized by a modern style. At disposal for the guests are beach towels and free internet connection. 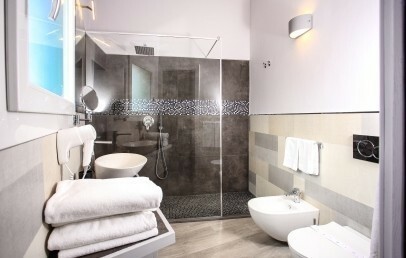 The bathrooms have a Shower with massage jets, complimentary toiletries, hairdryer and a vanity mirror. From the private terrace equipped with couches and table there is a spectacular view on the sea. Spacious and bright Junior Suite with a window door that opens onto the private terrace. The terrace is furnished with table and chairs and offers a beautiful view over the sea. The bathroom has a hydromassage shower with fragrant essences, hairdryer, bathrobes, sponge slippers, make-up mirror, courtesy set. An ideal suite for a relaxing stay.